Ronnie Pungowiyi (left) cheers his slug on during Saturday's Slug Race. 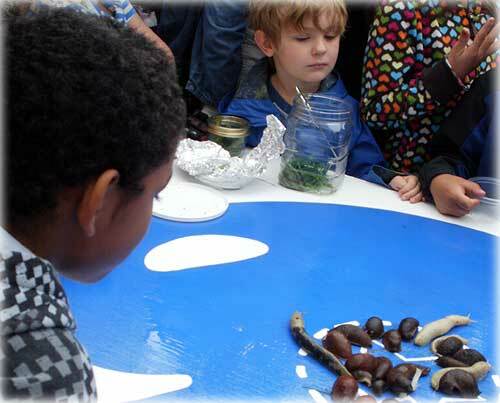 The Slug Race was one of the many scheduled events of the 35th Annual Blueberry Arts Festival which was held this past weekend. 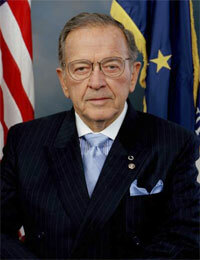 Alaska: Former Alaska Sen. Ted Stevens dies in plane crash - Ted Stevens, the colourful American senator from Alaska, has been killed in a plane crash that occurred 17-miles north of Dillingham, Alaska Monday night. Stevens, who survived a similar crash in Alaska in 1978 that killed his first wife Ann, was on a junket to a fishing lodge courtesy of the telecoms company GCI when the aircraft came down in bad weather in a remote part of the state. Five of the nine people on board the plane are believed to have died. Fish Factor: Permit bank encourages fishermen & coastal communities By LAINE WELCH - Catch share programs can cause consolidation, trimming the number of vessels and stakeholders in a fishery. After all, that's a primary goal: to rein in too many boats going after too few fish. Too often, rights to the fish get bought, sold or leased away from small, fishing dependent fishing towns. New England fishing communities are making sure that doesn't happen to them as they transition to a catch share program for groundfish next year. Bankrolled by $5 million from the federal government, 'permit banks' are being set up to buy fishing permits for 19 groundfish species, and lease the catches to boats ported in Maine, Massachusetts and Rhode Island. The permit banks will be operated by each state or by private nonprofits. A permit may be worth between $150,000 and $400,000 depending on the number of pounds attached and the species. "Without a permit bank, there would be a handful of large boats fishing right off our communities that had no access to the resource right off their shores," said Philip Conkling, president of the Island Institute in Rockland, Maine. The Institute and Nature Conservancy piloted the program two years ago. They lease poundage to fishermen who also test new net configurations. There are two important qualifications to access the permits,: a boat must be 45 feet or less, and home port in a town with fewer than 30,000 residents. That's a lesson learned from Alaska, said the Institute's Rob Snyder. "The need for permit banking came directly from our watching the halibut and sablefish fishery consolidate in Alaska, and how small boat communities tend to disproportionately lose out in these allocation battles," Snyder said. Fishermen and coastal communities are encouraged by the permit bank opportunity, and hope it will anchor small boat fleets in their historical towns. "The fishermen who are hanging on and trying to stay in the fishery are incredibly encouraged," Snyder said. "I think the folks who would like to get back in someday are holding their breath and hoping this works. But all in all, people are very enthusiastic in the small ports where this is happening." Philip Conkling credited federal fishery managers for finally paying attention to the little guys. "This is the first time we've seen in New England that NOAA or anyone else in Washington has paid attention to it," Conkling said. "For the past 20 years, the national dialog has been all about scaling back and increasing efficiency in the fishing industry. There has never been any national level interest in trying to find equitable means when a fishery needs to be consolidated, to make sure the big fish don't eat all the little fish. So NOAA deserves a lot of credit in being very active in the community equity issue." Southeast Alaska: Information sought in shooting-related death of sea lion - NOAA Fisheries Office of Law Enforcement is asking for the public's help in finding out who shot a Steller sea lion that was found dead on a beach north of Juneau last week. A thin and lethargic sea lion was first reportedly sighted on Tuesday, August 3, 2010 between Amalga Harbor and Boy Scout Beach. It was spotted again in the same vicinity the following day. The deceased sea lion was discovered on Boy Scout Beach at about 5:30 p.m. on Friday 8/6/10. Alaska: More Actions Needed to Help Western Steller Sea Lion Recover - NOAA's Fisheries Service says changes are needed to the areas where commercial fishermen may fish for groundfish off Alaska's Aleutian Islands to further promote the recovery of the western population of Steller sea lions, and to be in compliance with the Endangered Species Act. That's the conclusion of the draft 2010 Groundfish Biological Opinion, released last week by the agency's Alaska region. The document addresses possible effects of current management practices for groundfish fisheries in the Bering Sea, Aleutian Islands and Gulf of Alaska on endangered species, including North Pacific humpback and sperm whales and the western Aleutian Island sub-population of Steller sea lions. Fishers harvest more than 4 billion pounds of fish from the area each year. Although scientists found that current fishing practices are unlikely to impact the endangered whale populations, such is not the case with Steller sea lions. The greatest concern is in fishery management area 543 in the western Aleutians. From 2000-2008, adult numbers declined 45 percent in this sub-region. Pup production declined 43 percent, making the ratio of pups to adult females on rookeries in this sub-region the lowest in the entire western Steller sea lion population. This continued low birth rate is an indicator of lack of food to sustain the population. Ketchikan Business: BRONZE MAIDEN SEAFOODS AWARDED BEST OF KETCHIKAN 2010 - For the second consecutive year, Bronze Maiden Seafoods, LLC has been awarded the "BEST OF KETCHIKAN 2010" in the Fish and Seafood category by the U.S. Commerce Association (USCA). Each year the USCA identifies companies that they believe have achieved exceptional marketing success in their local community and business category. According to the USCA, these are local companies that enhance the positive image of small business through service to their customers and community. National: GOP in Congress attacks 14th Amendment's birthright citizenship clause By MICHAEL COLLINS - Rep. Elton Gallegly has argued for nearly 20 years that one way to fight illegal immigration would be to deny citizenship to U.S.-born children of people who enter the country illegally. It has been a lonely battle. Until now. Frustrated by Congress' failure to do anything to curb illegal immigration, a number of prominent lawmakers are suggesting the time has come to consider repealing or rewriting the 14th Amendment to the U.S. Constitution, which guarantees citizenship to anyone born in the United States. "I don't like tinkering with the Constitution," said Gallegly, R-Calif. But, "we have people who are violating the law to come here just for that benefit (of citizenship). And it truly is a benefit." The 14th Amendment, ratified in 1868 to guarantee citizenship to children of former slaves and other immigrant communities, declares that all people born or naturalized in the United States and "subject to the jurisdiction thereof" are citizens. National: Social Security, at 75, strained by recession, boomers By ANITA CREAMER - Evelyn Sekula's widowed grandmother struggled to survive during the Depression. Like millions of other elderly people, she had no pension and no savings. "She had no income at all except for what my father gave her"-- maybe $10 a month, said Sekula, 90, who lives in a senior residence in Sacramento County, Calif.
Today's older adults were youngsters when President Franklin D. Roosevelt changed the face of aging by signing the Social Security Act into law on Aug. 14, 1935. They remember when old age took place in a bleak, Dickensian landscape of need. They remember the difference that Social Security made in ordinary people's lives. And they remember their parents' fears that Social Security amounted to socialism. Yet on the eve of the program's 75th anniversary Saturday, most of them can't imagine retirement without the small cushion of funds and dignity that it provides. Social Security lifted the elderly out of poverty -- and as the most important source of income for most older Americans, it continues to do so, says Jean Ross, executive director of the California Budget Project. RE: The Whitecliff Factor By Penny Eubanks - As the Plaza Manager at the time of the RFP (request for proposal) for the Borough offices, I noted right off the get go the apparent slants. I found it quite interesting to remember that in September of 2007, I believe it was, The Ketchikan Daily News reported on Dawson's purchase of Whitecliff building. In that article, Dawson himself noted that they were planning to remodel the building for Borough offices. Mind you, this was PRIOR to the January 2008 date that the Borough actually put the RFP out! Oh by the way - Dawson did not pay the $50K downpayment until the VERY day the RFP went out for public bid!!! Does something stink here? (Who is taking another bite out of whose apple?!) - More..